There’s something about kids and squeezable pouches of food. There’s also something about toddlers and not eating. Therefore, when I got a request to review Squeez’Ems reusable food pouches, I suspected this might be a winning combination. At around 2-3 years old, I’ve noticed that all of my kids sleep better at night if they eat a good bedtime snack. This is also the age at which I night wean them, but then find I’m still awakened all night by a kicky toddler who seems to be hungry. So, we work hard to get a nutrient dense bedtime snack in them before bed and eventually the sleep for all improves. The sticky point can be what snack to offer. When Zander was little, we tried all kinds of different smoothie recipes, hoping for a magic combo. With Alaina, we do string cheese a lot and she rejects a lot of our other suggestions. Enter these little reusable pouches. Food is infinitely more intriguing to a little child when it is in a squeezable pouch. The first night, I filled it up with Greek yogurt and she slurped it all down and asked for more. Zander, who is seven now, also enjoyed two pouches worth of yogurt. See what I mean? Instant intrigue! 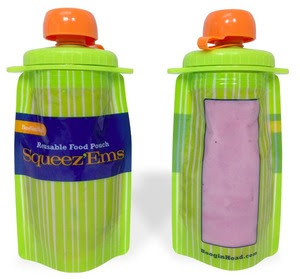 However, there are two other great features about using the Squeez’Ems pouches instead of buying pre-pouched food: you know exactly what is going into it (no weird, additive-filled store purees) AND you can just wash it out and refill it, rather than trashing pouch after plastic (or foil) pouch! I call that a win for the ecologically-minded as well as for the bedtime snacking toddler. The company also notes that they are a good match for children with food allergies who may not be able to eat the same pouched foods being eaten by their contemporaries. I look forward to experimenting with some additional smoothie recipes and trying them out in these pouches! For more info on Squeez’Ems, please visit www.booginhead.com. Squeez’Ems are available at BabiesRUs stores and Amazon.com. Disclosure: I received a complimentary two-pack for review purposes. I have no further relationship or financial benefit from this company. Molly, how do you find the washability? If they get forgotten somewhere with a bit of whatever left in them for a while, is it fairly easy to get out? Do they retain odors? These have definite roadtrip possibilities!